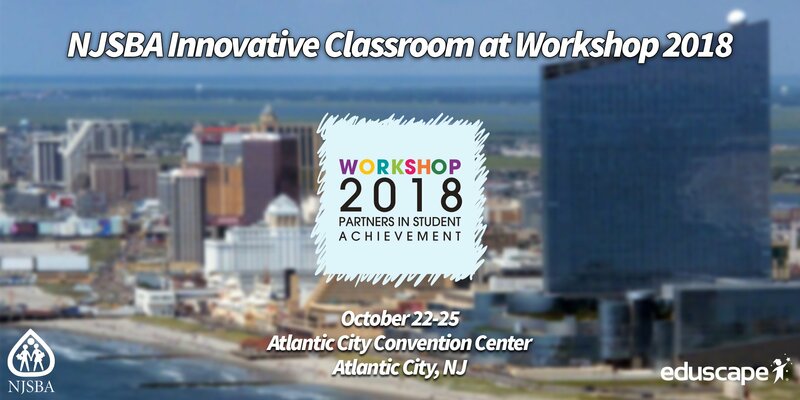 MONTVALE, NEW JERSEY, October 9, 2018 – Eduscape will be leading presentations in the NJSBA Innovative Classroom Space, powered by SHI, at NJSBA Workshop 2018; the largest conference for school leaders in New Jersey being held on October 22-25 at the Atlantic City Convention Center. The Innovative Classroom Space will be displaying the latest engaging, interactive classroom technologies, including displays, devices and modern classroom and innovative spaces furniture. Presentations will be held throughout Exhibit Hall hours on October 23-24 and led by experienced educators who have taught in New Jersey schools. “The NJSBA continues to evolve into an organization focused on its mission to advance public education by developing and delivering exemplary training; and, informing its members of the important trends in education and school leadership. We are truly honored to have this opportunity to deliver engaging and informative presentations on critical topics for today’s school leaders. As a parent of three children being educated in New Jersey schools, it’s important that we invest our time to advance the knowledge of the leaders who dedicate their own time to improving education in our state.” stated Alex Urrea, Managing Partner and Founder of Eduscape. Headquartered in Montvale, New Jersey, Eduscape is one of the leading professional learning organizations in the country. Its team of experienced educators has developed and delivered professional development to over 600,000 educators and school leaders. The organization’s expertise ranges from interactive technologies, classroom productivity applications to STEM Education. Eduscape is the only New Jersey-based Google for Education National Training Partner, a leading Microsoft Global Training Partner and the only privately-held certified provider of the ISTE Educator Certification. It has been selected by over 20 award-winning STEM product companies to develop their training academies. The company is also the professional learning partner for Common Sense Media and it’s highly regarded Digital Citizenship curriculum and programs. This November, Eduscape Global will launch at the China Education and Innovation Exposition to introduce Eduscape’s STEM Made Simple program to over 100,000 educators.